The Bose QuietComfort 35 (Series II) Wireless Headphones are among the most popular products we covered this week in the deals section on BGR. That might seem odd any other week since they’re so expensive, but this week it makes perfect sense. Why? Because Amazon is offering an extremely rare discount on them right now. 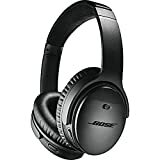 And when you have the opportunity to buy the best noise cancelling headphones that Bose has ever made at a discount, you take it!